From the Hancock County Courthouse, go northwest on Hwy 15/16 for 0.6 mile. Stay left on Hwy 16 West at the Hwy 15/16 split. Go 8.8 miles to Green Spring Road (dirt) on right. 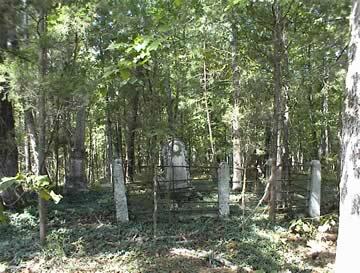 Turn right on Green Spring Road and go about 2.8 miles (this cemetery is about 250 feet north of Baugh Cemetery). This cemetery is on your left on top of a knoll, covered with periwinkle and surrounded by granite outcrops and pavements. Note: Frequently Green Spring Road is impassable. The cemetery may also be reached from the north. Mt. Gilead Methodist Church was established in the 1840s and survived the Civil War (see Shivers). Kimbrough suggested that the site of the original Mt. Gilead Church is now at the site of Green Spring Cemetery. Aged 70 years. "No ostentation mark'd his tranquil way, His duties all discharged without display"
"Our Father". On same gravestone as Nancy C. Lawrence. "He closed a life of Christian usefulness with the triumphant expression: 'I am not afraid to die'"
"Our Mother". On same gravestone as Seaborn J. Lawrence. "Her children arise up and call her blessed"
Capt., Quartermaster, 44th Ga. Inf. w/o W. J. Neary. All info per Mary Cannon, who is great granddaughter. s/o W. J. Neary and Tranquilla Catherine Parrott Neary. All info per Mary Cannon. At least 6 more graves marked with field stones. Possibly many more.